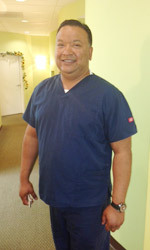 Dr. "Sam" has been a dentist since 1988, and in private practice since 1992. Dr Sam has made it his highest priority to continue his education and study with some of the most respected dentists in the United States and stay up-to-date on all current procedures by attending and participating in continuing education and scientific sessions for multiple disciplines of dentistry. He is an active member of the following associations. KSMDA Karnatataka State Medical Dental Association. Dr. Sam specializes in cosmetic, general and children/family dentistry, and is known in the Corona and Norco area for his great care, friendly demeanor and high-quality and beautiful dentistry. Mandy is a Registered Dental Assistant (RDA). Mandy came to us after graduating from Bryman School of Dental Assisting. She and her gentle touch have been with us for 10 years. She is currently working towards her degree in Dental Hygiene. Mandy coordinates scheduling of patients, and chair-side dental assisting. Evelyn is a Dental Assistant (DA). She has been with us for one year. Dr. Sam and our patients love her and we're glad she's with us.